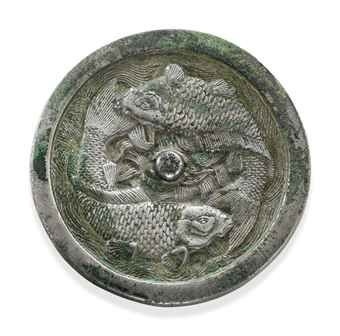 Bronze mirrors with the twin carp motif are prevalent in northern provinces such as Jilin, Hebei, Shaanxi and Henan. The twin fish motif is typical during the Jin dynasty, and is thought to have been probably based on the same design on Song dynasty mirrors. Provenance: Robert H. Ellsworth Collection, New York, acquired in Hong Kong, 1989. Note: Another twin carp motif mirror of comparable size is found illustrated in “Ancient Bronze Mirrors” from the Shanghai Museum, Shanghai, 2005, pp. 350-1, no. 136. The knob on the Shanghai mirror centers a flower head and the two carp are set farther away from the knob, and the line of their lower body is straight creating an almost square area around the knob. The fish on the above depicted mirror appear more naturalistic in their twisting movement and outline. See, also, the similar mirror illustrated by Ju-hsi Chou in Circles of Reflection: The Carter Collection of Chinese Bronze Mirrors, The Cleveland Museum of Art, 2000, p. 89, no. 86, where the author notes that mirrors of this type are prevalent in “northern provinces such as Jilin, Hebei, Shaanxi and Henan.” He also mentions that the twin fish motif is typical during the Jin dynasty, and was probably based on the same design on Song dynasty mirrors.